Hospitality Style magazine, published by Cincinnati-based ST Media Group International, showcases a sizzling editorial lineup in its summer 2010 issue, themed “Getting the look for less.” Developed for the hospitality design industry, Hospitality Style’s summer edition explores value engineering measures used in design processes; visits with Olivia Putman, head of Agence Andree Putman (and the legendary designer’s daughter); tours innovative bars and spas throughout the world and highlights luxury projects by today’s top designers, including Silvia Tcherassi, and two hot design firms, Uxus and Prospect Design. Although we’re mixing in luxury projects, what we’re emphasizing in the editorial is the creative ways designers ‘value engineer’ their concepts to make sure they’re getting the biggest bang for the buck, or euro or RMB. Hospitality Style covers hospitality design with the eye of a fashion magazine in a photo-rich, large-scale (10” x 12”) format. The summer edition spans the hospitality sector, giving designers, architects, and operators/ developers of hotels, restaurants, spas, casinos and cruise ships extraordinary coverage of current hospitality design trends and projects. Issue highlights include an in-depth look at the newly created Tcherassi Hotel + Spa, inspired by break-out fashion designer Silvia Tcherassi of South America. Housed in a colonial building, the hotel combines modern fashion with a clean Morris Lapidus vibe. With a focus on strategic, cost-effective design work, readers will also witness the Heaven and Hell rooms at Dada Restaurant and Bar in Hong Kong and experience spas from Austria to Paris to Shanghai. In addition, the editorial team dives into the worlds of two leading design firms, Uxus and Prospect Design, to uncover their ingenious methods for creating elite design work at reduced costs. 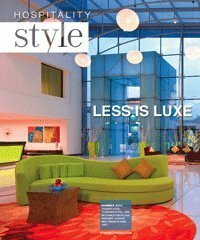 Accompanying the print edition is a robust website (HospitalityStyle.com) with exclusive editorial content and a weekly e-newsletter, Hospitality Style PULSE. The end result is an integration of print and online content unlike any in the hospitality design industry. To subscribe, visit hospitalitystyle.com or call 800-421-1321/513-421-2050, ext. 0 (free to qualified subscribers). To advertise or receive a media kit, call brand publisher Michael Schneider, at 513.263.9379, or visit HospitalityStyle.com. Located in Greater Cincinnati, ST Media Group International Inc. serves the visual communications industries with its trade publications, branded websites, a custom book division and industry events. Publications include Visual Merchandising and Store Design, Boutique Design, Screen Printing, Signs of the Times, The Big Picture, Package Design Magazine, Industrial + Specialty Printing and Signs of the Times & Screen Printing en español.